PowerUltrasonics is an independent resource for all users and manufacturers of power ultrasonic and sonochemistry equipment. If you're a supplier please check and update your entry in the ultrasonics suppliers database, since new fields are available for you to include more detailed information about your business. More details and instructions on the Latest news page. To those of you who have already seen the planned improvements to the site and given me your opinions - thank you. I am listening but have limited time to work on this so please be patient! If you haven't yet, please see the developments page, or have your say on the discussion forum (bulletin board). 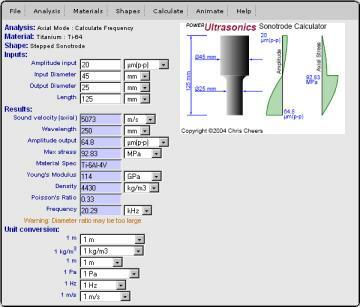 First draft of the specialised ultrasonic component calculator is now up for testing and comments. This offers sound velocity, wavelength and frequency calculations for some simple shapes in commonly used materials such as steel, titanium and aluminium. Newcomers to the technology should start with the introduction to power ultrasound for an explanation of the physics and a description of the equipment used. Then the anatomy page describes the components of a high power ultrasonic system. Finally the applications page describes a variety of high-power industrial applications such as cleaning, cutting, forming, machining, sieving, sintering, welding and sonochemistry. Technical articles and research papers from researchers around the world. Specialist books on: ultrasound physics sonochemistry transducers and materials industrial applications provided by Barnes and Noble . 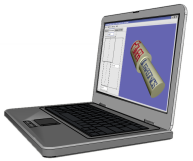 Read more about Power Ultrasonics - What? !